During the summit in Singapore June 12 between US President Donald Trump and North Korean supreme leader Kim Jong Un, the US commander in chief saluted a North Korean official, newly unveiled footage shows. Shortly after Trump and Kim shook hands in front of the press for the first time, the duo walked into a private room where a North Korean military official stood. 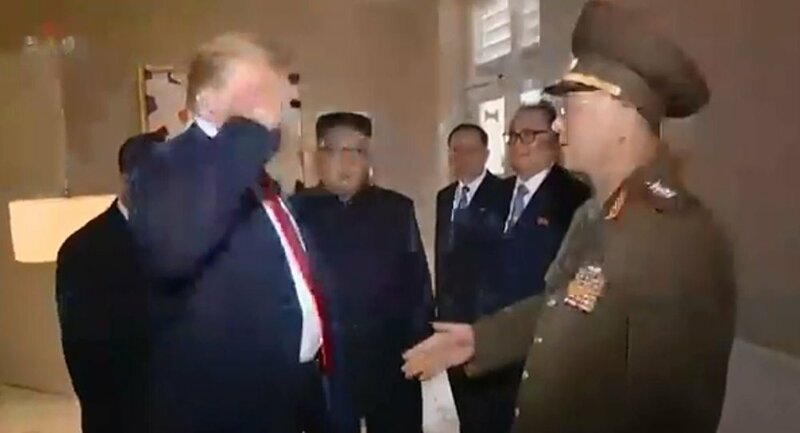 Footage released through North Korean state television shows Trump extending a hand to the official, who simultaneously lifted his hand in salute. Trump mirrored the officer and saluted back before shaking the officer's hand. ​It appears that BBC Monitoring was the first outlet to pick up on the gesture. US conservative news and entertainment outlet the Fox News Channel lost its collective mind in 2014 when then-US President Barack Obama committed the grave error of saluting US Marine officers outside Marine One while holding a chai latte in his right hand. GOP strategist Karl Rove lamented the greeting, asking, "How disrespectful was that?" Trump's personal friend, Fox News host Sean Hannity, ripped the 44th president as a "chai-swillin', golf-playin', basketball trash-talkin'" commander-in-chief. ​Will Hannity treat Trump's military gesture to a North Korean general the same way on his TV show Thursday evening? Nobody knows for certain, and it's possible it won't get any air time. The New York Magazine reported in May that the pair "like to talk before bedtime" and sometimes talk multiple times per day "with one calling the other to inform him of the latest developments," so if Trump wants to squash this video from appearing on Hannity's show, there is certainly a history of close communication between the two that would enable that message to be transmitted loud and clear. White House Press Secretary Sarah Huckabee Sanders told reporters the gesture was a "common courtesy" to officers from foreign countries in response to being saluted.